SAP Screen Personas 3.0 SP07 now available. More mobile capabilities, more enterprise features. Thank you to our SAP Screen Personas customers for rapidly adopting the Slipstream Engine. It seems we are fulfilling a need to run classic SAP GUI transactions on mobile devices. SAP Screen Personas 3.0 SP07 builds on that foundation and adds more mobile capabilities, more enterprise readiness features, and over 150 enhancements. We are also seeing a rapid uptake in the SAP S/4HANA installed base, who are using SAP Screen Personas to complete the Fiori vision of having simple and beautiful screens that run on any device. In the last service pack, we introduced the Slipstream Engine to render SAP Screen Personas on mobile devices. Now, we have added the SAP Screen Personas editor to the Slipstream Engine so you can create flavors and render them in the same environment. 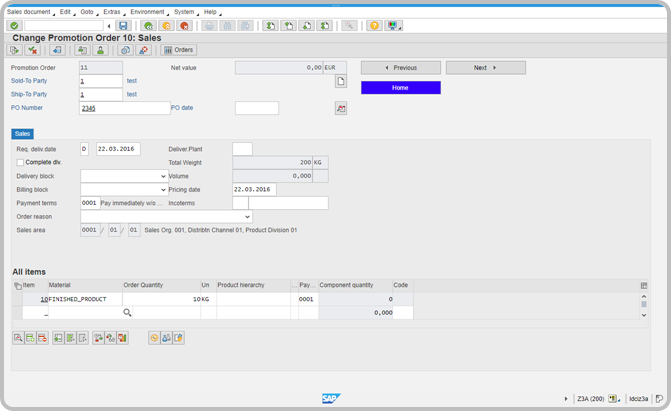 So, you have a complete, end-to-end, what you see is what you get (WYSIWYG) platform for simplifying your classic SAP GUI Screens. The SAP Screen Personas editor works on the desktop only (yes, the Slipstream Engine runs on desktops as well as tablets and phones) as you need the full screen real estate to build flavors. The flavor editor includes scripting, theming, templates, and everything you need for creating mobile (or desktop) flavors. With the editor running in the Slipstream Engine, there is no need to fine-tune your flavors due to rendering differences between Slipstream Engine and the Web GUI. To make it faster to build flavors for a variety of tablets and phones, we added a mobile preview feature to the flavor editor. 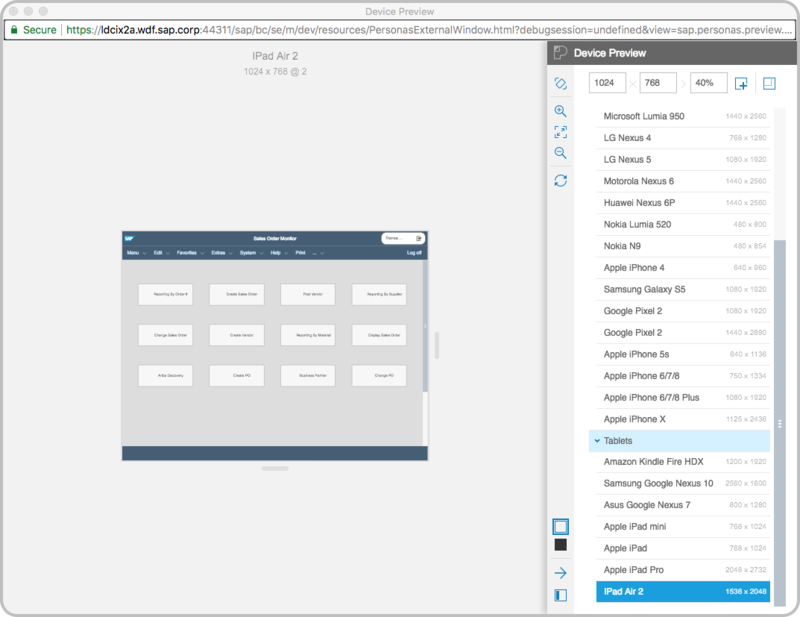 Now, you can preview what the flavors will look like on iPads, iPhones, and Android devices, all while staying in the editor environment. As more customers use SAP Screen Personas for more complex tasks, they occasionally create flavors that perform many functions behind the scenes to present a simple screen to users. This could include showing and hiding different parts of the screen and even moving controls around dynamically to give users a manageable amount of information to process at a time. To handle these business scenarios more easily, we created a new feature called Viewports. Viewports break a large, complex screen into smaller pieces, only showing your users the required fields for each stage in a business process. You can even use Viewports to create a guided, step-by-step approach for your users, where you can add or hide different functions. In SAP Screen Personas 3.0 SP07, viewports are available as an API in the scripting engine. We are working on a GUI to simplify working with viewports. We will be showing SAP Screen Personas SP07 at SAPPHIRE now and the ASUG Annual Conference. SAP Screen Personas as Part of the SAP Fiori User Experience: With the latest version of SAP Screen Personas software, SAP has made it even easier to create SAP Fiori-inspired flavors that run on your desktop, tablet, or phone. 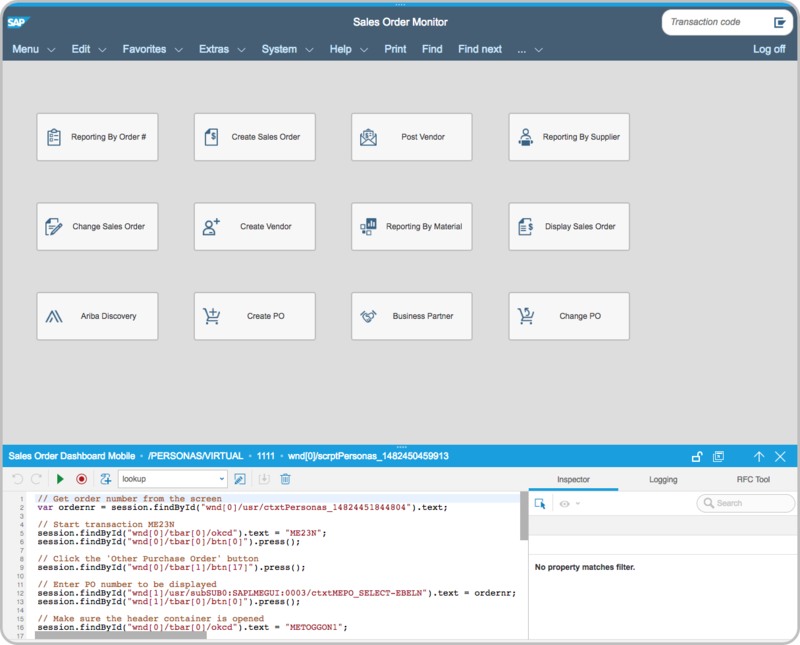 Themes, templates, and best-practice guides allow many customers to create a seamless user experience and go live with SAP Fiori-inspired screens within weeks, often with no development resources. Wednesday, June, 6, 2018 at 11am. Roundtable: Going Mobile With SAP ERP or SAP S/4HANA Using a Mix of SAP Screen Personas and SAP Fiori Apps: Join this roundtable discussion on how to render classic SAP ERP transactions on your tablet or phone. The presenters will discuss how to choose between SAP Screen Personas software flavors and custom SAP Fiori apps to balance functionality, time to value, development cost, and maintenance costs. This talk will also cover the latest SAP technologies for mobilizing flavors. Wednesday, June, 6, 2018 at 2:30pm. Here is our current support strategy for SAP Screen Personas 3.0. SAP Screen Personas 3.0 will be supported until at least Dec. 31, 2023. This rolling 5-year support is the same as S/4HANA. This is a minimum of five years from the release of this service pack, rounded to end of the calendar year. We support the current as well as the two previous Service Packs. What does this mean to you? Kernel release 742 is out of maintenance. We no longer test on this kernel release. See the SAP Screen Personas 3.0 SP07 Master Note 2633027 for more details and updated recommendations. The SAP Screen Personas team is planning to continue to enhance mobile capabilities and address the growing needs of enterprise customers that are striving to become intelligent enterprises. Please send us your requests (via email or as a comment to this blog) for anything you would like to see in SP08 and beyond. Upgrade to SAP Screen Personas 3.0 SP7 (requires valid NetWeaver License). Take the free Introduction to SAP Screen Personas openSAP class to get a foundation for starting your project. Extend your knowledge with the Using SAP Screen Personas for Advanced Scenarios openSAP class to go deeper into how to use the product. Learn more from our knowledge base with articles on a variety of topics. Watch the Productivity Power Play episode on SP07. Any plans to add a table like control in the Personas editor. Some of the screens require a table like control, that is currently not available. Thank you for the suggestion. This is something we are thinking about. If you have specific ideas for how you would like this to work, please email me. Congratulations, you are clearly working hard to make SAP Screen Personas an outstanding tool for SAP Customers. I can not describe how much I enjoy that. I agree with Sandeep that tables are a “basic” feature still missing in Personas. As an architect/developer, I know that working with tables is a pretty common business requisite and we are still limited on that with Personas. I love the product and I am clearly saying that for the sake of good improvement. I’ve a question. A company have just installed SAP Personas 3.0 on July. Why did the consultant company choose to install SP4 if is out of support in a brief period, instead of SP5,SP6 or SP7? Is it a matter of reliability? I’ve just found dumps in /personas/admin transaction on SP4. Does this mean that probably it needs some upgrade? Generally, it is best to install the latest service pack. This will include all the latest notes, as well as the newest functionality. Our internal processes ensure that any software we release will be reliable. However, the underlying kernel requirements might differ between different service packs. This would be a valid reason for installing something other than the latest version, if the customer is unable or unwilling to update the kernel. Have you asked the consultant why they made the decision they did? If you are able to move to one of the kernels listed above, I recommend you upgrade to SAP Screen Personas 3.0 SP07. You will benefit from all the innovations we have added since SP04, most importantly the mobile rendering in Slipstream Engine. It seems they installed SP04 because of the software components level. There’s a 745 kernel release with 319 patch level. From sap notes https://launchpad.support.sap.com/#/notes/2633027 it is mandatory having a minimum patch level 600 for kerner 745. Is there a solution to update personas to SP07 to get mobile features without updating kernel patch level? If not then is it a big deal? The kernel requirements are there because some of the rendering capabilities are provided by services in the kernel. If there is a minimum requirement specified, SAP Screen Personas will not work properly if you do not have the right prerequisites. If you want to use the mobile and other capabilities of SP07, you will need to be on the correct kernel version. I would like to know if it is planned to have the Personas theme compatible with the Fiori Launchpad theme ? Or at least have only one theme designer for both technology ? SAP Screen Personas is flexible on what themes you apply. We have Fiori themes available on the Flavor Gallery that will match the standard Fiori launchpad theme. The default theme in Slipstream Engine is the Fiori theme. This will give your transactions, with or without a flavor, the Fiori look. Use flavors to simplify to deliver the full Fiori experience. Theme Designer works with SAP Screen Personas for the overall look if you are using a browser. It does not work for specific controls, such as table color. We have the SAP Screen Personas theming features to allow compatibility across the different SAP GUIs, so flavors will look consistent in SAP GUI for HTML and SAP GUI for Windows. Theme designer does not work in SAP GUI for Windows as the SAP GUI for Windows does not understand CSS, which is a web-based technology. one thing I would like to see in the next version is more control to GuiTableControls wich is very limited at the time being. For example, in VA01, in the sales overview, the client wants to have the items list bigger, which is impossible at the moment. Is there a timetable for the release of the next version? You have done an excellent work so far, keep up doing so that SAP Screen Personas can evolve even more. It’s been a pleasure to work with Personas e see the changes every version brings. Thanks for your suggestion regarding the GUITableControl. We hear this quite often from customers. We have identified this enhancement as a backlog item and will be reviewing possible options to allow users to increase the height of a row in the table. At this point though, we can’t commit to any timelines. If you have other recommendations on how we can improve the user experience with the GUITableControl, please send me an email. We plan to release the next service pack for SAP Screen Personas before the end of 2018. Thank you so much for helping us make SAP Screen Personas better with each version. thanks for you answer. Despite changing the height of a row in the table will be a nice feature, what I was asking was about the height of the GuiTableControl in general so you can see more items on the screen. I have received the question from customers a few times on why Personas will not be made available on Fiori UI5 apps. The logic behind their question is that, if they want to do some basic layout changes in an existing fiori app, the development cost is very high. While the same layout changes in other screens can be done quite easily by using Personas. We designed SAP Screen Personas to simplify screens that use Dynpro or Web Dynpro for rendering. SAP provides tools to modify Fiori apps. You can use Web IDE for this.